It’s time to live a little! 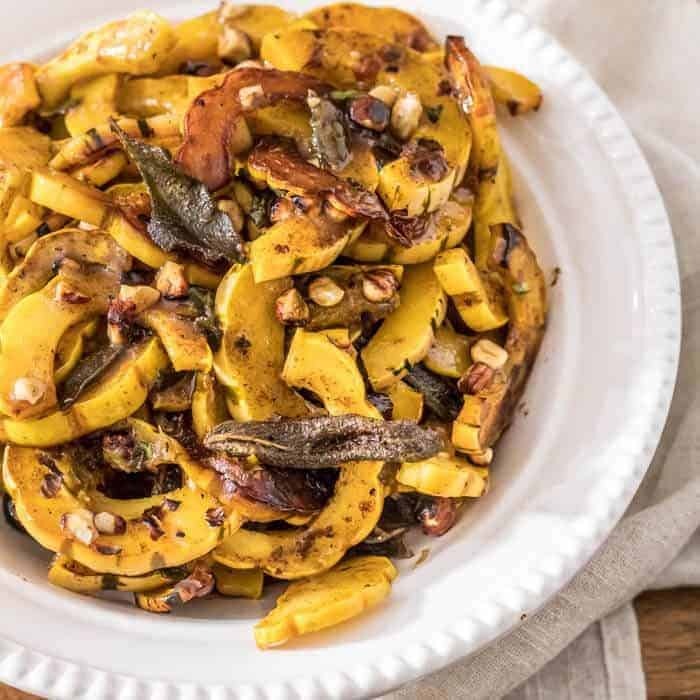 Not one but two delicious autumnal sauces grace my Thanksgiving roasted delicata squash. 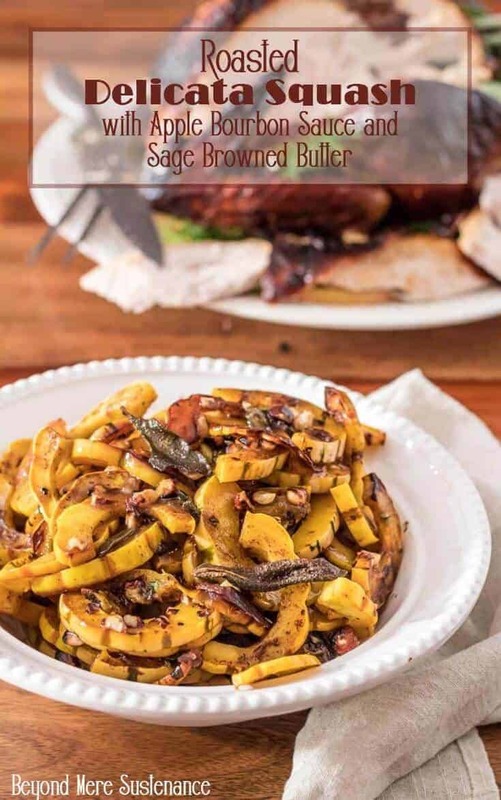 Roasted Delicata Squash With Apple Bourbon Sauce & Sage Browned Butter is doubly delicious, and makes an elegant but not fussy side dish on your holiday table! 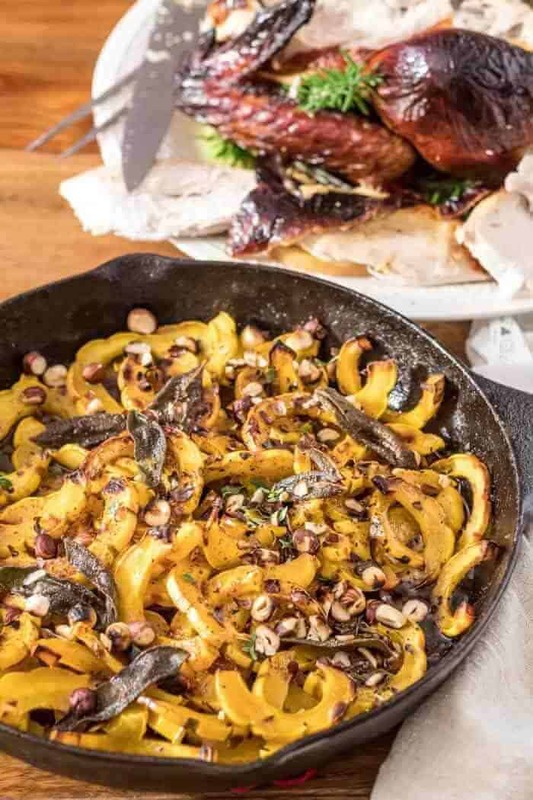 I may need to seek a position on the delicata squash promotional board – if one exists 😉 Just recently I posted Chipotle Honey Lime Glazed Roasted Delicata Squash and Autumn Stuffed Delicata Squash With Apple Bourbon Sauce. The latter provided the inspiration for this Thanksgiving side dish. The apple bourbon sauce was divine with the roasted and stuffed delicata squash. Had I not decided to take this recipe a step further, it would still be an awesome dish. However, aren’t we all entitled to a little excess over the holidays? “Excess” to this girl with far-too-much discipline usually means butter or cheese. This dish has no cheese, but the crispy sage browned butter has BUTTER! MORE BUTTER (did you ever watch the British cooking show “Two Fat Ladies?”). They were always saying “more butta!” 😆 While I try to keep holiday excesses within reason, it wouldn’t be a holiday without enjoying an occasional splurge. Do you have a guilty pleasure during the holidays? Thanksgiving is a day to… be thankful. In spite of it all, or because of it all, we need a day to count our blessings so to speak. While the days, weeks, and months ahead hold angst and anxiety for many of us, we love and are loved, and we have the ability to take action to reach out to the marginalized… to those less fortunate than we are. So, bearing this in mind, I want to wish you the very best this Thanksgiving 2016. Indulge a little, be thankful a lot, and follow it up with a run, a bike ride, a trip to the gym. It does a body good! Beautiful delicata squash are rather simple to break down, and so sweet and delicious when roasted! Topped with an apple bourbon sauce, and a sage browned butter sauce, then garnished with toasted hazelnuts and fresh herbs, this recipe is sure to be a crowd pleaser on your holiday table! 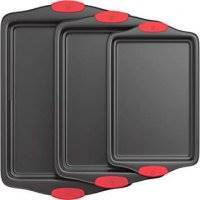 Preheat oven to 425 degrees (400 convection roast). Slice squash in half lengthwise. Remove seeds and pulp. (They are great in stock). Slice across to form half moons. Toss with olive oil, and season with salt and pepper. Arrange on a baking sheet. Roast until edges are caramelized and squash is tender, about 25 minutes. While the squash is in the oven, make the sauces. To a small saute pan over medium high heat, add the olive oil and minced shallot. When the shallot is fragrant and soft, add the bourbon, and cook until liquid reduces by about half. Add the apple cider, chicken broth, dijon mustard, and vinegar (if using). Cook until mixture slightly reduced - about 4 to 5 minutes. Season with salt and several grinds of pepper. Meanwhile, melt butter in heavy large skillet over medium-low heat. Add sage leaves and cook until edges curl and butter is dark amber (do not burn), stirring and turning leaves occasionally, about 6 minutes. Transfer sage to paper towels. Keep butter warm. 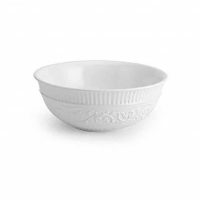 A ramekin works well, and it can be "zapped" in the microwave if need be. 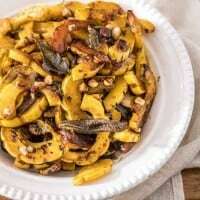 Place the roasted and seasoned squash in an appropriately sized serving bowl. Pour the apple bourbon sauce over top, and toss gently to combine. Drizzle the browned butter over top. Garnish with the crispy sage leaves, toasted hazelnuts, and fresh thyme leaves. We love a bit of acidity in most of our dishes. 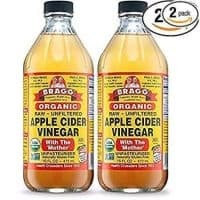 I use a good quality unfiltered apple cider vinegar which is actually pretty smooth and mild. If you're not a fan, either start with less and taste it, or omit the vinegar entirely. I love European butter. French and Irish butter are widely available in US markets. Use your preferred butter. This recipe works well with butternut squash, however, the prep is more time-consuming. The thin skin of delicata squash is tender and can be eating with the flesh. I just LOVE the sound of the apple bourbon sauce!! Hahaha and I love The Two Fat Ladies! Have you seen the 2 Greedy Italians? It's a couple of British Italian chefs (Antonio Carluccio and Gennara Contaldo) touring Italy uncovering the food of their childhood. It's such a fun show and reminds me a lot of Two Fat Ladies. I think you'll like it! The apple bourbon sauce is really good, and so simple to make! I love the Two Fat Ladies, and I will look forward to checking out the 2 Greedy Italians :-) Thanks Jennifer!